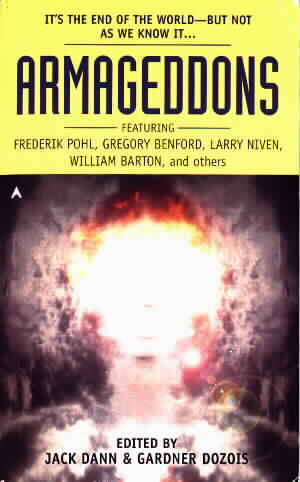 Armageddons, edited by Gardner Dozois and Jack Dann. A book review by jpoc. For those not familiar with the format, Jack Dann and Gardner Dozois have compiled a large number of themed anthologies each of which contains a number of stories dealing with a single topic. This book fills its 269 pages with twelve stories on the subject of the end of the world. They date from 1951 to 1998. Five of those stories are well worth reading but the rest are filler. The finest story here is "A Pail of Air" by Fritz Lieber. It tells of a dark star passing through the solar system and dragging the Earth away. Without the sun it gets so cold that even the air freezes. How can people survive in this world? The other truely outstanding tale is Frederick Pohl's "Fermi and Frost" which describes a world slowly freezing over in the wake of a nuclear war. If you have not read those two stories before, they pretty well justify buying the book. Gregory Benford, Nancy Kress and Raccoona Sheldon (aka James Tiptree Jr.) merit mention for their three stories all of which deal with the potential of advanced biotechnology to finish us off. The remaining stories do contain some interesting ideas but in general, they are just not very well written and I think that the editors could have been more critical in the material that they included. Pohl, Frederick: "Fermi and Frost"
Benford, Gregory: "A Desperate Calculus"
Cowper, Richard: "A Message to the King of Brobdingnag"
Waldrop, Howard: "...The World, as We Know't"
Sheldon, Raccoona (James Tiptree Jr.): "The Screwfly Solution"
Leiber, Fritz: "A Pail of Air"
Danzig, Allan: "The Great Nebraska Sea"
Landis, Geoffrey A.: "The Last Sunset"
Barton, William: "Down in the Dark"